Samsung has filed a trademark for the Galaxy 360. It hasn’t used this moniker for a product before. There’s a solid chance that the company is going to use it for its 360-degree camera. That product has previously been called the Gear 360. Samsung has recently been shifting some of its Gear branded products to the Galaxy umbrella. Case in point: the Gear smartwatches. Samsung’s latest smartwatch is actually called the Galaxy Watch. Samsung has already changed the branding for its smartwatch and it may do that for other devices as well. We have already reported exclusively that it’s planning to change the Gear VR’s branding to Galaxy VR. So it can be reasonably assumed that it will do this for the Gear 360 as well. Samsung has launched two generations of its 360-degree camera already and is due to launch another. Both were called Gear 360. If this trademark application filed with the USPTO in the United States is anything to go by, the next one will be called the Galaxy 360. 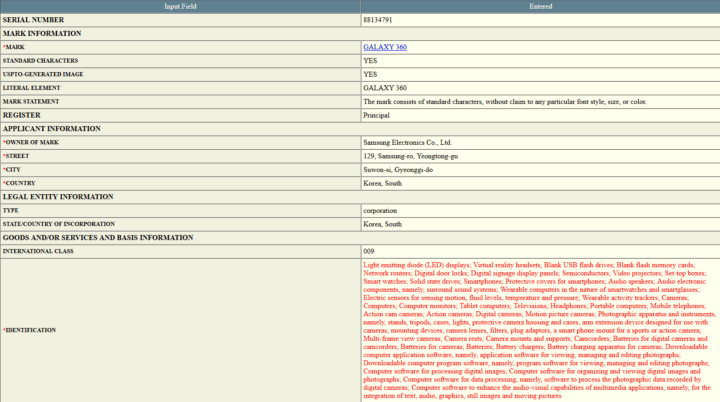 This trademark application confirms little beyond that Samsung is working on a new 360-degree camera. No further information is available about this product right now. It can’t be said how it will differ from its predecessor. It’s also not known when we can expect it to arrive. Its predecessor was released in early 2017. The trademark filing for the Galaxy Watch appeared three months before the smartwatch was announced. Perhaps we might see a similar gap for the Galaxy 360 as well. It feels like a long time since we’ve seen a new 360 camera.